As forwarded by an anonymous tipster. 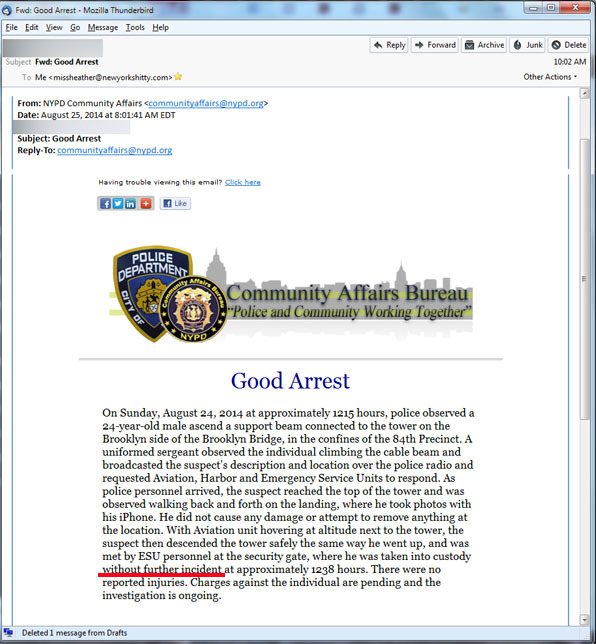 Is it just me or is “blasting” a mass email about a “good arrest” kind of confirming the recent trend of (and this is being kind) “bad arrests” we have learned about lately? So let me get this straight. Suspected of selling loose cigarettes while being a black male? That merited a chokehold. Skip a subway fare while being a black male? That’s a serious asskicking. But being a colossal dumbass (of unspecified race it would seem*) wandering around the tower of the Brooklyn Bridge taking photos with your iPhone? Well, that seems to merit a “good” arrest. Live From Last Night’s Debate: The Questions Commence! This is the first installment of this evening’s debate. More to come. Given my site is acting up again (Yeah, I know) I’ll continue adding footage as I can. Otherwise, I’d advise everyone to check my YouTube page. There you will find it all! Josef, one of the Greenpoint community’s more colorful characters, talks up Councilman Levin after said proceedings.